I'm somewhat relieved that I'm not writing the post I thought I would be writing today. Yesterday afternoon, after I picked up the kids from school, we stopped at Kroger before going home. As we were walking into the store, we saw a black cat (probably about 4-6 months old?) run out from some bushes in the parking lot. The cat looked around frantically, looking scared to death, and then darted back into the bushes. The poor cat looked extremely skinny and its fur didn't look very healthy at all. When I see the feral or stray cats in neighborhoods, I feel awful for them and want to bring them home, but I manage to restrain myself (we have enough pets). But the Kroger parking lot was a different story! There aren't any houses in close proximity to the store, and the bushes that the cat was hiding in were on a little island of landscaping in the parking lot. Basically, I could safely assume that someone had just dropped off the poor cat. I couldn't just leave it there. It was 10 degrees outside and we were expecting more snow through the night. So, the kids and I went over to the bushes and started calling to the cat, hoping to coax it to come out. The bushes were pretty thick, and I couldn't see the cat in there. We eventually went into the store, and decided to look again on our way out. When we left the store, we went back over to the bushes, and tried again. Still no cat. So as sad as it made me, we went home. When Jerry got home, I told him the story, and he felt awful, too. He decided to take a can of cat food and see if he could find the cat, and if not, at least leave the food for it. He tried for about 20 minutes, but he didn't have any luck either. I really don't want any more pets, but there was no way I could have left that cat in the parking lot! So, I imagined I'd be writing a post today about Janice, our new kitty (or maybe Gunther, if it was a boy). Anyway, I just hope that someone else picked up the cat and that he or she is nice and warm in someone's house. Last night, Jerry was off work, and we decided to share a bottle of wine in the evening. I mentioned recently that I haven't been drinking wine much lately, and I've turned into a total lightweight. A bottle of wine is 25 ounces, so I had 12.5 ounces--and I actually woke up feeling hungover! I never used to feel hungover from half a bottle of wine (it's only about two generous glasses). My stomach felt gross, and I had a bit of a headache. Perfect for doing speed work! Ugh. The kids' school ended up being canceled today because it was snowing like crazy, adding to the ice and snow that are already covering the roads. 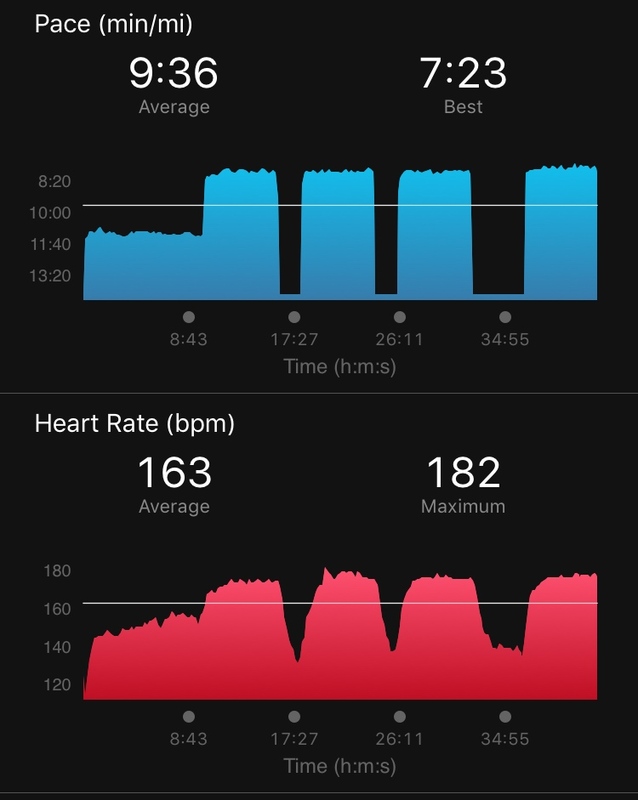 I can't do speed work in the snow (well, I could, but I would probably fall on my face), so I went out to the garage to do it on the treadmill. 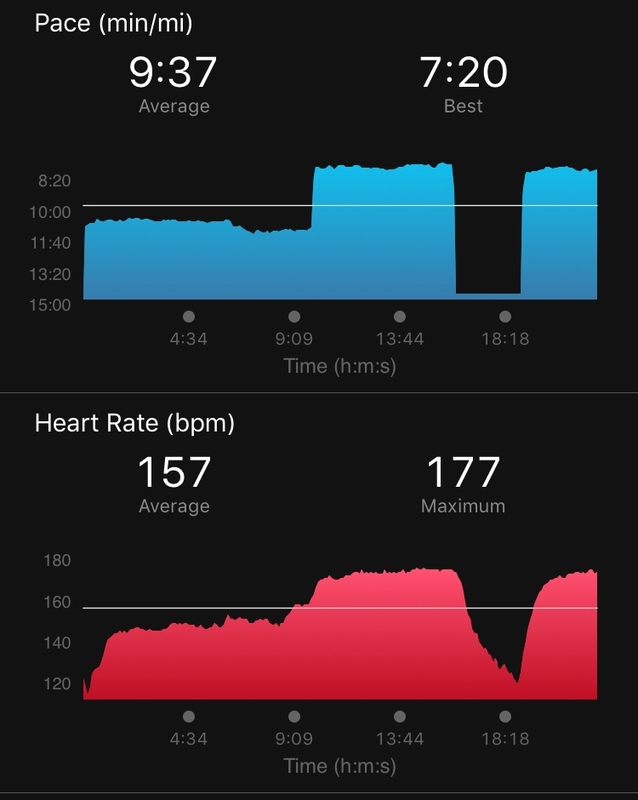 On the schedule today was 4 x 6:00 at faster than race pace, with recovery until my heart rate gets down to 136. I started with a 10 minute warm-up. I felt guilty for the whole rest of the morning, and was still thinking about it after lunch. I told myself I could make it up on Thursday, but I still felt like I should have pushed myself through and finished the workout. Finally, at around 1:00, I decided that I was going to try again. 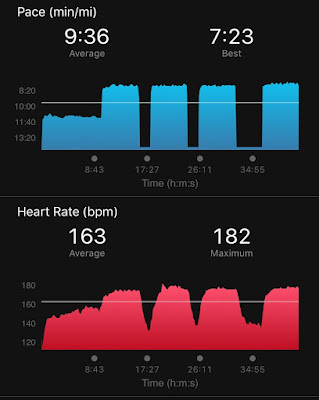 I was feeling better, and even though I was warm and cozy inside the house (and showered), I decided to change back into running clothes and attempt to do the speed workout (again). 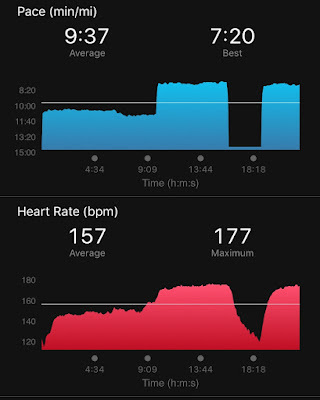 This time, after my warm-up, I started my interval at a more conservative pace (7.8 mph, or 7:41/mile pace). It doesn't sound like a big difference from the 8.0, but it felt more comfortable. I told myself if I could just get through two intervals, I could stop feeling guilty. Bonus if I could get through three! It was NOT easy by any means, but I managed to push myself through three intervals. Then I decided to go for the fourth. Even though I had done one and a half earlier in the day, I knew I would feel really good to get the whole workout done at once. And just to torture myself further, I even decided to set the speed at 8.0 mph for the last one, and finish strong. I pushed myself to the max, and I did it! I had run all four six-minute intervals at 7:30-7:41 pace (and 1% incline). I felt much better about myself after that! 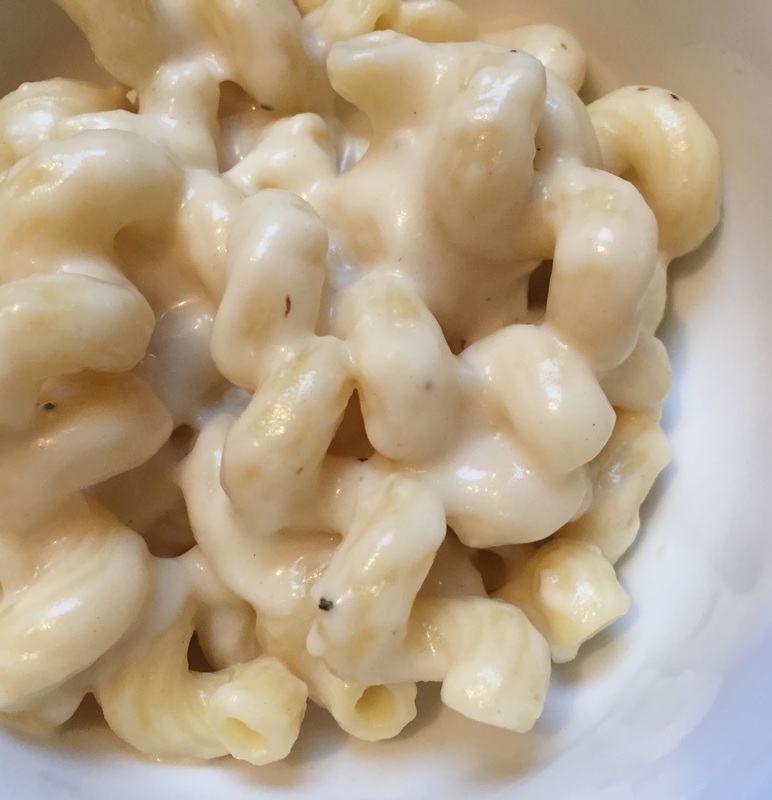 For Taste Test Tuesday this week, I chose to try this recipe for Creamy Garlic Penne Pasta. It's basically pasta with a garlicky béchamel sauce and parmesan cheese. I love garlic and pasta, so this sounded delicious! I didn't have any penne, so I just used cavatappi instead. I was so good--lots of garlic flavor, which my whole family loved. It made eight servings, so I had it for lunch the next day, too. If you haven't already, make sure you check out my annual Runs for Cookies Virtual 5K details and sign up! Here is a link to the post that explains all about it. I'm the same with kitties - I hope that baby is safe and warm somewhere. Awww that's so sad about the cat. At least you gave him/her the possibility of a meal. I hate seeing them scared. MMMM thanks for the pasta recipe! And thanks for trying to save the kitty. I am one that would have been there with you, on my hands and knees trying to coax the kitty out! I had a similar story with a kitty just a couple of weeks ago. From our living room, you can see directly out our patio door that leads off from the kitchen. I was sitting on the couch just watching TV and caught movement out of the corner of my eye and saw a beautiful white little Kitty staring at me! He kind of reminded me of your Paulo. I walked over to the door and we had a staring contest and I called my husband upstairs but as soon as he walked by the door, she ran. Don't know if he spooked her or what. It was so cold out too! I felt so bad! We tried looking for her again but couldn't find her. I can only hope she found a warm home somewhere. I don't know what I would have done if we had caught her but I feel so bad just thinking about her out there on her own! Great job getting it done! I have the hardest time doing speed work on the treadmill. I have a brand new, nice treadmill but the faster paces that I could hit outside feel way too fast inside and there's no way I can finish them out! I am totally impressed with you getting those intervals done! Guilt is such a "great" motivator, ;D but it sounds to me more like pure determination. Woo hoo! Love your determination to finish your run. You are amazing! I also love how you wanted to help that poor scared kitty. I know he/she appreciated your attempts and also the can of food you left. I have gotten to the point where I can't even read the sad stories about cats and dogs that proliferate on Facebook. It hurts too much. I just take such joy in my cat and dog and can't imagine anyone mistreating a pet. Also love that you had already picked kitty's name (Janice or Gunther--keeping your Friends' theme going) These are just three reasons I love you Katie--there are so many more!! !